It’s Disney’s turn to take on the classic Edgar Rice Burroughs’ character of Tarzan as I continue my exploration in the highly addictive Sci-Fi Chronicles book. Tony Goldwyn lends his voice to the animated film, along with a star-studded ensemble including Lance Henriksen, Minnie Driver, Brian Blessed, Glenn Close Wayne Knight and Rosie O’Donnell. This adaptation ends up being good family fun, while staying fairly true to the spirit of the earlier films and original book. 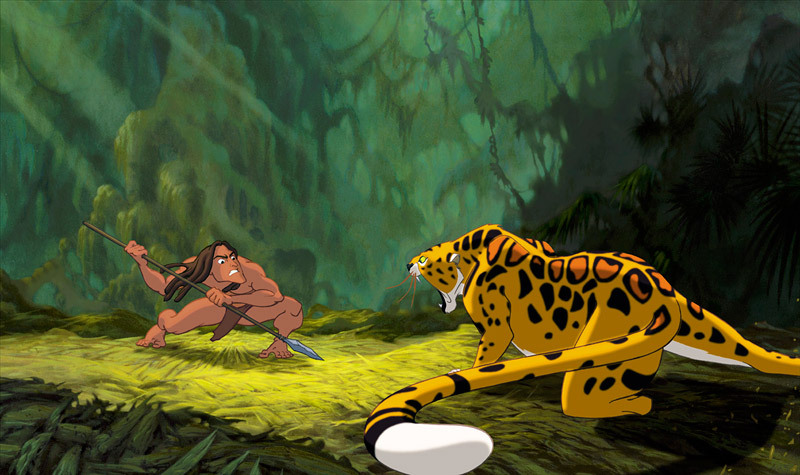 When his shipwrecked parents are killed by a leopard, Tarzan (Goldwyn) is taken in and raised by gorillas, where struggles to be accepted by his adopted family, including the alpha male of the group, Kerchak (Henriksen). But under the supervision of his mother, Kala (Close) and the companionship of his best friend Terk (O’Donnell) and elephant Tantor (Knight), he might finally be accepted, if he can stay out of trouble long enough. Unfortunately trouble comes looking for him in the form of Clayton (Blessed) who is leading Jane (Driver) and her father Professor Porter (Nigel Hawthorne) in search of gorillas for study. Tarzan, who, as in previous versions, is a mimic is immediately enchanted by Jane, who, while not necessarily the strongest female character Disney has created, is definitely stronger than some of her cinematic predecessors both in regard to Disney and Tarzan films. As Tarzan moves through the gorgeously design, drawn and painted backgrounds, he moves, in turns, like an ape, a skateboarder and a surfer, moving nimbly through the environments with an ease that none of the films have previously captured. Filled with fun songs, great character designs, and wonderful settings, this film embraces its excitement and fun, even as it races to its climax, which sees Clayton not only betraying Tarzan, but the Porters as well as his greed, and desire to make money off the gorillas by bringing back specimens (alive or dead) drives him. This version of Tarzan tells of family, acceptance, love, betrayal, and loss, all in a wonderfully colorful Disney style, but never completely losing sight of its source material. I found myself nicely swept up in this film, and realized it had been over a decade or so since I had last seen it. It stands up nicely, and of course, there are some nice Easter eggs to find in the film, but overall, what this film is, is an enjoyable film, with great messages that introduces younger viewers, as well as older ones to the world of Edgar Rice Burroughs and the mythology that continues to spring up around the character. I’m also a sucker for a good Phil Collins tune, and find myself singing a number of the tracks in this film on a regular basis. What is your favorite incarnation of the Lord of the Apes?